My family have been around for a long time, and can be traced back to the founding Cistercian monks in Ireland under Clairvaux, with a mention again later of my great (x10) granda in Melifont Abbey: St. Pyloniuous of Uisneach. But hang on Paddy, I hear ye say, how can you have a monk for a grand-da? The truth of the matter is that back then they drank and sang like the rest of us, then they shagged like the rest of us, and so had families like the rest of us. It is only the modern church that brought in these desperate rules about chastity – and look whats happened to them. Its not rocket science – if you don’t shag, you don’t produce. Anyways, I stray off my intended topic, the family motto. 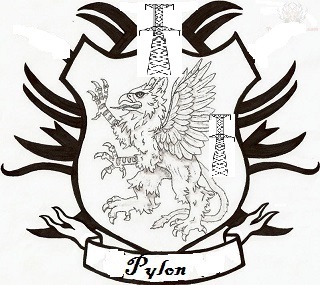 One of the things you get when belonging to a very old family like the Pylons is a very old family crest and motto, and mine is: Si autem perseveraverit Patricius noster, et bene habebunt. My ma and da didn’t have a clue what it said, and they couldn’t be arsed anyways. So when I was studying at Maynooth, I asked an old Humanities Professor to translate it for me, and I still have what he wrote: “If Paddy perseveres, he will find success”. You could have knocked me over with a shot glass when he told me that – it was all about me! Not that it helped, as I dropped out of college about four months later. In one of the letters sent by readers – and I must thank ye with tears in my eyes – the hundreds of letters written to me and Peig and Saoirse has made this whole struggle with EirGrid that much easier to bear. Theres even been letters to the aul horse and that feckin kitten! Thank ye truly. In one of these letters your wan said I should be gettin a job. I reckon it was wrote by me mam, but she denies it. Now let me just tell you missus that I’ve been for a job interview every day for the last four months but the bartender keeps saying that he don’t need an assistant, so what can I do? Anyways, I was sitting and looking at the few pieces of silver that was left from the EirGrid payment and I knew that I needed a plan, and then it hit me – a fair for Paddy’s Day, in the back yard with The Pylon. Sure enough, on Paddy’s Day I stuck out the poster over the old Sherry FitzG. sign that still stands outside the house – Paddy’s Pylon-the-Fun – and for five euros a head the kids could play their all day whilst their ma and da get peizheined with the drink. Jaysus, the pylon looked grand. I covered it with all the small trees and branches blown off during the storm, and called it the Jungle Bunny Bash with the gossoons climbing all over the thing. I was wicked afraid of the leukaemia so I got the young ones to wear lead jackets from my mate at the refinery – told them they were astro-jackets from the space shuttle and they were delighted to wear them. It was brass monkeys up there so it kept them warm as well. I tied a long rope to the other side of the pylon so the chisellers could shimmer down that, and the old slide that Saoirse used to play with rested nicely on the struts. T’was grand altogether and the young ones had a fine old time and I made a few spandulix. Later, after a few jars, I was watching your man Pat Shortt and laughin me head off and thinking how grand it would be if he could have Pat Rabbitte as a guest. We know that old Pat is always up for a laugh and he could be the guest in a comedy sketch about PCIs, which are Projects of Common Interest (when two or more EU countries get together and do projects stretching over national boundaries). Pat doesn’t want us to know that. And nor does the EU Commission want us to know that, specially as it is controlled by the wind industry and possibly the Mafia. Anyways, better late than never. So I thought that Pat Rabbitte could tell the nation about all these PCIs on the Pat Shortt show. My sketch would be along the lines of your young wan with giant knobs sitting in a pub and Pat would wobble up to her and say: “Come back to my place and checkout my PCI”. And your wan would wrinkle her nose and say: “Whats a PCI?”. And Pat would say: “A Project of Common Interest, har har shlurp”. And your wan would slap him and then Pat could rub his cheek and explain into the camera what a PCI is and just how many there are planned for the Irish countryside. See – a bit of comedy with your education. Brussels need to start some straight dealing when they make these plans to build monster wind-farms in Ireland, and the government needs to start telling us about all these deals it is doing on the sly, otherwise we might get to know another family motto: Lepus Fugax Veritati.